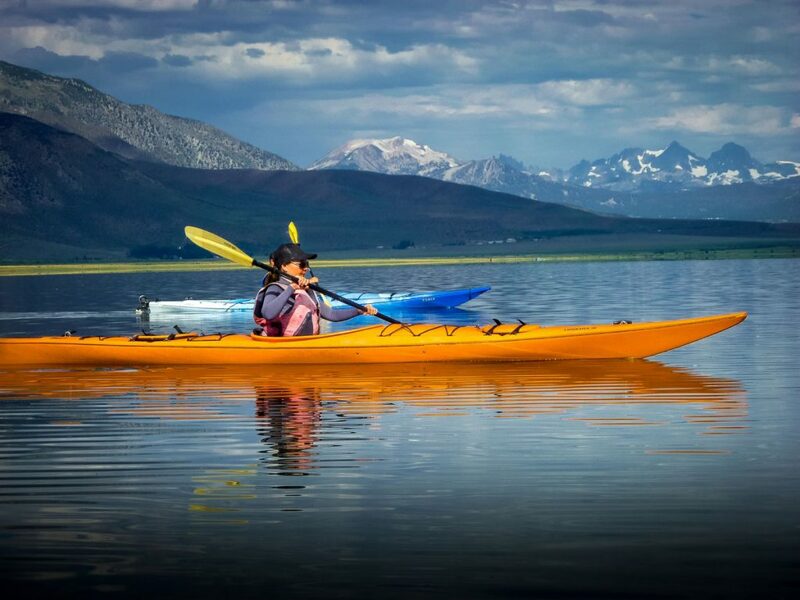 Imagine surrounding yourself with massive alpine peaks more than 11,000 feet tall, from the comfort of a kayak. Relax as you your boat glides across the glassy surface with panoramic views of the craggy spires of Mount Baldwin to the southwest, the rocky tuff of the volcanic tableland to the south, massive Mammoth Mountain ski area to the northwest, and the classic Eastern Sierra skyline of the Minarets to the north. The 14,000 peaks of the White Mountains tower to the east, and on a clear day, you can even see Mount Dana in Yosemite National Park to the North. 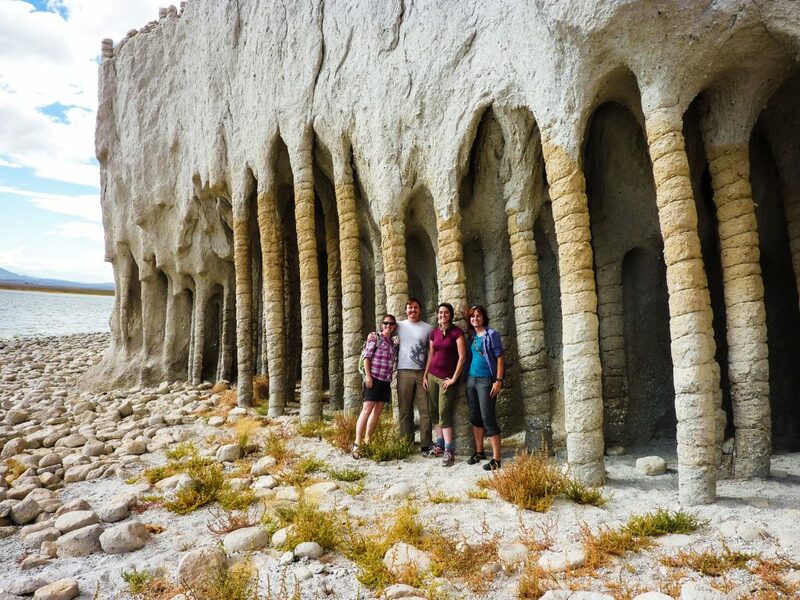 Explore a shoreline teeming with birds and jumping with fish and step back in time, and tour ancient and odd formations of Bishop Tuff, created from a super volcano explosion 767,000 years ago. Lake Crowley is a world steeped in ancient geological history. You will literally go back in time, viewing rocks and land formations created hundreds of thousands of years ago. 767,000 years ago, a mega volcano erupted, erupting volcanic ash that drifted as far away as present-day Nebraska. A giant pyroclastic density current (also called ignimbrite) erupted from the violent explosion and created the Bishop Tuff formation, which can be seen across the landscape from south of Mono Lake to north of Bishop. In the wake of the explosion that ejected 150 cubic miles (450 cubic kilometers) of magma, the super volcano collapsed leaving behind a giant depression 10 miles x 20 miles (16 km x 30 km) that is now Long Valley Caldera. A large portion of the south and east shoreline of Lake Crowley has fascinating exposures of the Bishop Tuff Formation, a rock lover’s dream. A narrow gorge cut into the rocks and forms the Crooked Creek inlet, offering a tranquil and secluded place to enjoy the lake. In fact, it’s one of the most scenic areas of the lake. On the east shore of the lake bizarre pillars, resembling dinosaur vertebrae, formed in the lower section of the tuff. The pillars formed by the interaction of water and the hot ash that created convection pipes as the fluids rose up through the ash. A mineral called mordenite gave the pillars increased resistance to erosion so they have been left standing as the softer matrix around the pillars has been washed away by wave action. Nevahbe Ridge (pronounced: neh-vah-be) to the south of the lake is composed of colorful Metamorphic rock formations that are hundreds of millions years old. Movement along the Hilton Creek over the years has created vertical cliffs of 5000 feet (1524 meters). Lake Crowley, one of the largest and deepest lakes in the region, is well known to anglers from all over the world. The lake, which was formed in 1941 by damming the Owens River, boasts 45 miles of shoreline, 5,000 surface acres and depths of over 100 feet, making it the perfect habitat for numerous trout species that are stocked there. The largest brown trout taken from the lake by one intrepid and lucky angler, weighed a whopping 26 pounds. While some of Lake Crowley’s trout are notoriously fearsome fighters, including the legendary beastly browns from Germany called Von Behrs, there’s enough variety in this well-stocked lake for anglers of all ages to fish in hopes of catching the big one. You’re welcome to bring your rod and reel and paddle one of our stable sit on top kayaks to see what kind of luck you have. Starting in August, regulations require barbless hooks so fly fisherman are on the water hoping to catch a big trout. Bring your binoculars. While Crowley is well known for fishing the varied bird life on the lake attracts bird enthusiasts near and far. From Canada Geese in the marshy areas in McGee Bay to White Pelicans on Pelican Point you will not be disappointed with the numbers and variety of species. You may also spot American Avocet, Western Grebes, Eared Grebes, Phalaropes and Terns. Swallows tend to nest in caves in the Bishop Tuff that have been created by wave action. We have even seen Bald Eagles from our kayaks. Osprey that nest up at Mono Lake in the summer visit Crowley in the fall to catch fish, their primary diet. Photographers will also enjoy an opportunity for close up views of the abundant bird life. Tours typically meet at the Crowley Lake Marina at 9am. 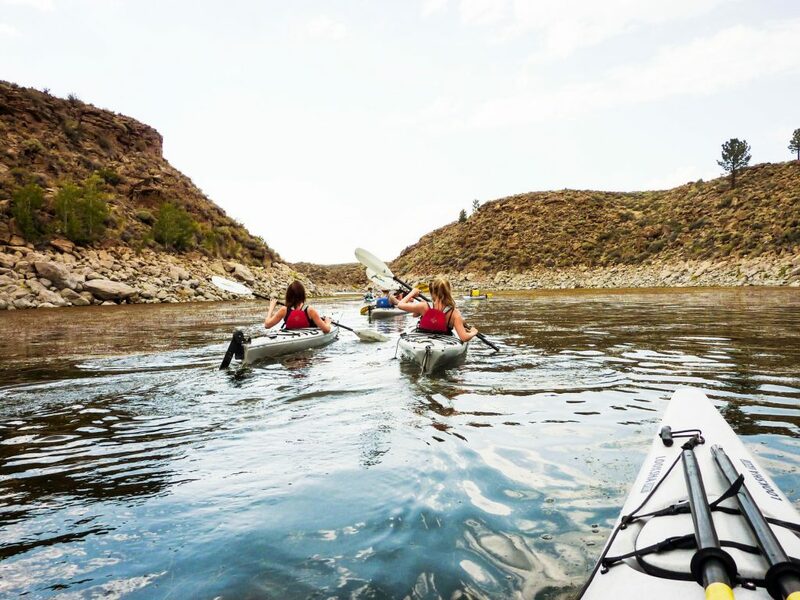 We will provide you all of the kayak equipment needed for your freshwater adventure. 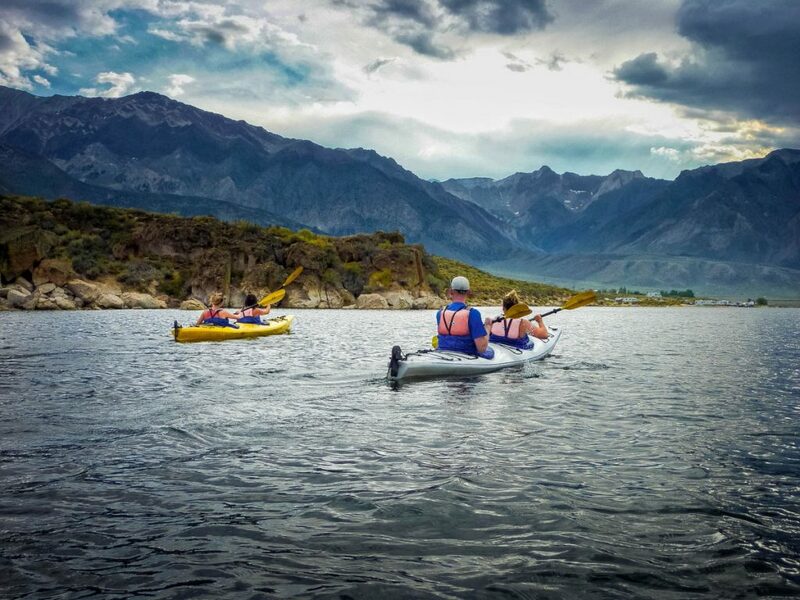 Don’t worry if you haven’t kayaked before, we provide a thorough orientation and instruction before we launch our stable and easy to operate sea kayaks. As you glide across the calm water you will have great views of the Sierra Nevada Mountain range to the south and the Glass Mountains to the North. Lake Crowley is located partially within the Long Valley Caldera that was created by a catastrophic volcanic eruption 767,000 years ago. Ash was found as far east as Nebraska and the Bishop Tuff Formation was created by the violent eruption. The Crooked Creek inlet offers calm waters in a narrow gorge lined by rock walls. For more experienced paddlers the pillars on the east shore of the lake make an interesting destination. The pillars were created by warm fluid rising slowly from marshy ground through the ash flows and created hardened ash compared to the surrounding material. The geological history of the valley is quite interesting and your guides will share their knowledge of the surrounding area as you paddle. You can expect dramatic views of the mountain ranges that surround the lake, varied bird life, interesting geological features and calm waters. Sheltered bays and inlets offer locations to land and enjoy a picnic on the shoreline. Lake Crowley is about 12 to 13 miles south of the town of Mammoth Lakes. From Mammoth Lakes take highway 395 South. Take the Crowley Lake/Hilton Creek exit off of highway 395 and you will turn left and drive over the highway on the overpass. Check in at the main gate and give the gate person your name and let them know you are renting kayaks. Go through the main gate and drive down the hill. Straight ahead is an area signed “trailer parking”. We set up our truck and trailer on the beach below the trailer parking area to the left of the flag. You can drive down into the trailer parking area.